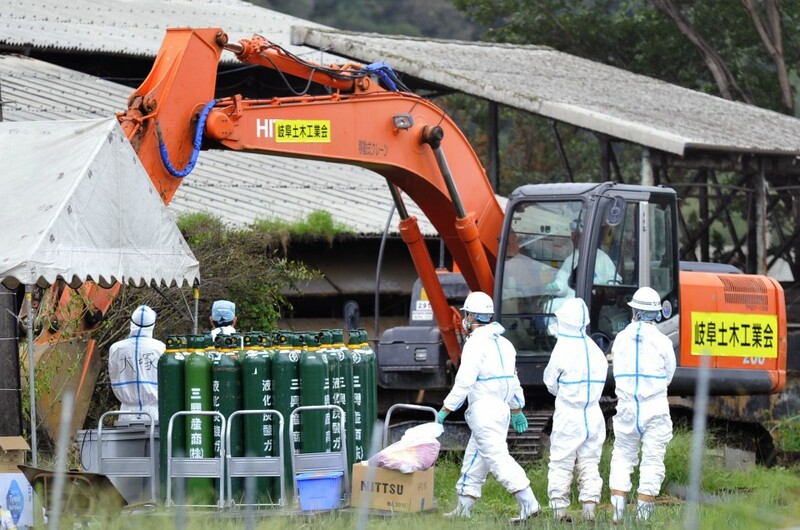 The outbreak of swine fever at a central Japan farm, which was confirmed over the weekend, has led to the culling and burying of 546 hogs and a halt in pork exports from across Japan to contain the infection, authorities said Monday. The shipment ban is expected to be in place for at least three months until Japan is declared clear of the disease, which affects only pigs and wild boars with almost a 100 percent fatality rate. Japan's pork exports totaled 1 billion yen ($9 million) in 2017. At the farm in the city of Gifu, around 140 pigs have died over the past week due to the disease, also known as hog cholera, which does not affect humans even if meat from an infected animal is consumed. With all the dead pigs buried at the farm by Monday morning, the disinfection of the facility is planned to be completed by Tuesday. Hog cholera is endemic in Asia but it is the first time since 1992 that an infection has been recorded in Japan. Tokyo had declared the virus eradicated in 2007. It is not yet clear how the outbreak started and the central and local governments will look into the cause. The Gifu prefectural government pointed to the possibility that wild boars or pigs that had contracted the disease may have been brought in from outside. The farm had been shipping pork until last Wednesday, two days after a pig had suddenly died there. While the animal did not test positive during a preliminary screening by the local government, further tests by the central government found on Sunday that the pig had been infected with the virus. Farm minister Ken Saito has pledged to contain the spread of the virus, saying at a task force meeting on Sunday, "First responses are crucial." The symptoms of swine fever include fever, loss of appetite and motor difficulty. Pork exports can resume with the approval of countries that receive Japanese pork products.